FEI supplied a team of highly experienced programmers to create the 2015 Bath Festival; forty-four classical, jazz and world music events over ten days in May in the beautiful World Heritage City of Bath. 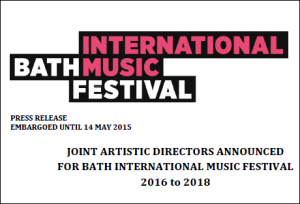 FEI is delighted to announce that James Waters of FEI and David Jones of Serious have been appointed joint Artistic Directors of Bath International Music Festival for three further years following the success of their first Festival this week. FEI have supported Bath Festivals on a wide range of assignments since 2010.